With the exception of our high school workshops, every student applying to our Musical Theatre School’s workshops and conservatory programs must complete an audition. Students have the option of either auditioning in person at the Academy’s New York City, Los Angeles, or South Beach campuses or if an in-person audition is not possible, applicants may submit a video audition. Applicants have the following options to audition for the Academy’s Musical Theatre School. They can audition in front of an admissions representative during an audition tour. 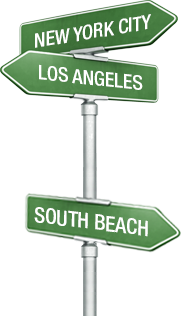 Applicants have the option to schedule an audition at either our NYC, LA, or South Beach campuses. If an applicant is unable to audition in person, he or she should send either a private YouTube link to the following email addresses or a DVD to the below addresses. To audition for the Professional Conservatory of Musical Theatre at NYFA, prospective students must submit an application. Applications can be completed online or brought to the audition. There is a required $65 application fee for the 1 & 2-Year Musical Theatre Conservatory Programs and a $50 application fee for the 4-Week Musical Theatre Workshop. Please prepare two contrasting musical theatre songs and one monologue from a contemporary American play (each piece should be approximately 60-90 seconds in length). When auditioning at the New York City location, a pianist will be provided. Please bring sheet music in a three-ring binder and in the correct key. For all other auditions outside of the NYC campus, please bring an accompaniment backing track with you on a USB or mobile device (instrumental only, no vocals included). We will not accept a cappella auditions (singing without music). For video submissions, please make sure to include your name, the titles of the pieces and shows you are performing from, and the program that you are applying to. Please do not choreograph your audition, use props, or perform into a microphone. We ask that you choose material that is age- and type-appropriate. It is important to remember that you must act your songs, so find pieces that excite you and that you have a personal connection to. The more connected you are to the character's circumstances, the more we are able to see your talent and personality.